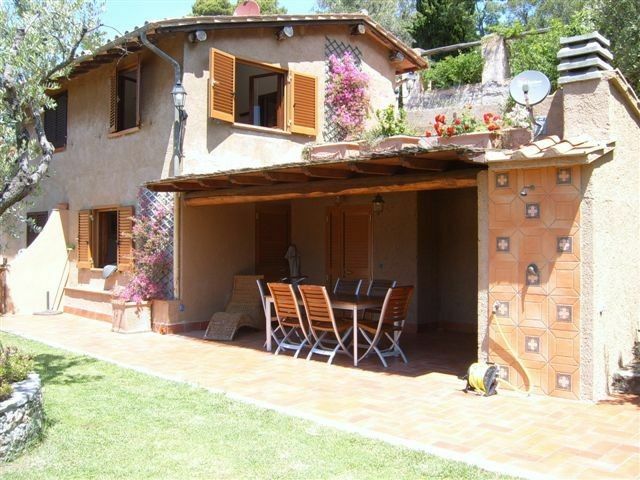 On the west coast of Monte Argentario, 2,5 hr from Rome Fiumicino Airport. 2 hr from Pisa Airport, 100 Sq meter house with 2 double beds, 1 sofa-bed, 3 bathrooms, a fully furnished kitchen, a very nice garden with a barbeque and a pergola, a big terrace (great to use as a solarium) and a private parking for the car. the house is 5 minutes walk from sea. In a gated community along the very rocky coast overlooking the islands of Giglio & Gianutri. The beach Le Cannelle: The sea is 5 minutes walking from the house, that is on the west coast of Monte Argentario, it overlooks the Medieval Tower of 'La Torre Delle Cannelle' . The Beach Le Cannelle is a very pretty part sand and part stone beach, with its romantic lookout tower and nearby Isola Rossa. e private and exclusive swimming pool club of Le Cannelle, which is located just behind the beach, adds an extra dimension for those who are staying in the Cannelle area. Membership of the club comes into its own should the sea ever be rough, thereby making swimming difficult, or at weekends in the middle of August, when the pretty beach of Le Cannelle can be quite crowded (by Argentario standards!). Club Piscina delle Cannelle is very secluded despite being so close to the beach. It is surrounded by Mediterranean maquis and cannelle (tall bamboo reeds) and is never crowded, as there are very few members. There are plenty of chaises longues, tables with parasols and shady seating areas either under a covered pergola or under Mediterranean pine trees. A lifeguard is on hand, giving extra reassurance to parents with small children, and there is an excellent small bar, which serves a variety of alcoholic and non alcoholic drinks, ice creams and, at lunchtime, a selection of toasted ‘panini’. For those that would prefer something a little more substantial to eat, there is a small restaurant built into the hill above the pool – as there are relatively few tables, a reservation for lunch is essential. gepflegtes haus mit sehr schönem garten. sehr freundliche vermieter, die eigentümerin hat für die ankunft sogar einige lebensmittel in den kühlschrank gepackt und etwas spielzeug für unsere kinder gekauft. der nahegelegene steinstrand ist über treppen und einen schotterweg in rd. fünf minuten erreichbar. We spent peaceful holidays in amazing place with beautiful nature. House is placed in a good location for enjoying sightseeings of Toscana. You easily can travel by car to Florence, Sienna, Rome etc. and it doesn’t take too much time. Car is necessary. Incredible sea with very clean transparent water. Stony beach for those travelers, who like rocks. Very peaceful place, we recommend it, if you want to rest from life in a big city and if you have small children. Nice house with everything, that you need during your holidays (except dishwasher). House holder meet you at Porto Santo Stefano , bring you to house and also give detailed directions about your own travellings by car. I recommend you to visit local marketplaces in Porto Santo Stefano, because they have very large choise of fish. Also while you are driving at Toscana, you can see near the road open docks, where big yachts are constructed. Impressive view. A very nice place with a fantastic nature around. The house is very well equipped, clean and well maintained. All necessary things (kitchen equipment, basic food-stuffs etc.) are provided, so you have not to bring everything with you. A local beach (more stony, less sandy) is very close. Nearest civilization (shops...) is about 10 km far, but it means about 20 minutes of driving on the asphalted very adventure panoramatic road. Buy everything you need, not suitable for everyday shopping. Car necessary. We can strongly suggest it for families looking a peacefull holiday. This property was very true to its description. Very clean and well maintained and in a fantastic location. The owner met us to direct us to the property and was very helpful with recomendations on what to do and see. We enjoyed the drive to Pisa and the drive to Sienna. The unique location provided time out whilst being in reach of supplies and good restaurants etc. All in all a most enjoyable time. For those who love peaceful holidays,very nice house,fully equipped and a short and pleasant walk from the beach.You just have to buy what you need to survive for your staying period and forget your car.LOVELY! Monte Argentario is a heavenly peninsula situated in the southernmost of Tuscany, at 41,5 kilometres far from Grosseto. The peninsula, overlooking both the Tyrrhenian coasts and the Tuscan Archipelago, is formed by an impressing The wooded green mountain, with more than 30 exclusives beaches and small bays along its rocky cliffs belt, preserves the look and the feel it had when it was an island, so to be considered by both national and international tourism the paradigm of a fabulous nautical vacation in Tuscany. wooded mountain with a surface of more than 60 square kilometres, reaching over 600 metres of highness. Porto Ercole and Porto Santo Stefano are incredibly picturesque little port..Along the front thereof both of them, is an excellent fish market and a profusion of restaurants, as well as the marina, where you can admire the beautiful yachts and luxurious gin-palaces. It is the perfect place for a walk. Book two weeks in April, May and June and you’ll get 20% off on the second week fee!